This time we have a multitude of happynesses to show. The amount of participants positively knocked me off my feet. Thanks to all who took part in this! First up is J.K. Riki's great entry of quackin' happyness! After that, it's Iestyn Roberts' happy awesome ice cream skid. Boy I envy that kid right now! Third entry is Owen Harvey's animation of pure olfactory pleasure, which seems to take Eleven right to the next happy level. The fourth clip comes from Jigar Chandra, who animated the happiest bus-schedule reader I've ever seen. Next up comes Tim Katzgrau's entry, who shows how easily a scrooge can be made very happy. Patrick O'Brien shows in his animation that balls with legs can be happy, too. Last up comes Guillaume Gilbaud with his awesome happiest pilot in the whole world! And I finally got to update this compilation so it now shows his final piece. Great work, all of you! So what I would like you to do is to have a character start running while it is already walking. Basically that's it already. But as you might already know me, this is just half of the drill. As you all should know, thinking leads to conclusions; emotions lead to action. So, I want you to first picture the reason why this character starts running? Does she see her boyfriend kissing another girl and runs to him, angrily? Or runs away, depressed and broken-hearted? Or maybe he is fetching his wife from the airport and spots her after not seeing her for three weeks? Maybe a passerby is witnessing a car crash and rushes to help? Or rushes to get a look if someone got hurt or died? There are multitudes of possibilities for you to explore, so dig in! You do not need to show (I mean actually display) the reason why this character is running, but we should be able to see the character's emotions and reason to start running. I'll keep the challenge at three week for now, so the new deadline would be May, 14th. As always, try to keep the video length to 75-125 frames. In January 2011, Michael Parks entered the 11 Second club with a delightful stop motion clip. His entry titled Pet Project was just pipped to first place by Edwin Schaap. One year later, he experiences deja vú as his January 2012, Mere Pass Maa, once again landed him second place. Being twice so close to being our first stop motion winner, we invited Michael to catch up and talk about his work. This time around, we handed the interview reigns over to Eric Swymer. Hey Michael, thanks for meeting with us yet again and trusting me with this interview. You are beginning to become a bit of a staple on this blog and we have gotten a chance to talk about you in a broad sense in our last interview. Let’s talk about your 2nd place shot Mere Pass Maa a bit. Your animation feels plays out like a surreal dream. Please tell us a bit about the story. I found the production of this entry was much more freeing. I figured that most viewers wouldn't know what the lines were, and could play around with absurdity. The goal was to do a fun piece with broad action, and yanking random things out of his jacket struck me as sufficiently absurd. This allowed the story for Mere Pass Maa to be a string of silly gags. My goal was to have something surprising and entertaining in every shot after the first introductory shot. Stop motion and clay animation gives the freedom of being able to do just about anything you want. You’re not limited by available rigs or models. If you want a silly little duck, you make a silly little duck within twenty minutes. It’s harder to produce smooth, subtle animation, but the trade-off is worth it. I could also tell any story I wanted. Storytelling is an important skill for animators to grasp, and it has been great to see 11-Second Club animators taking on the challenge of telling a short story within their entries. This was especially evident in the February “whiz palace,” where we saw a great many creative interpretations of the setup and action. You put on the description that it was just 3 days of prep. Last time we spoke much of what you used was found and recycled, were your models and props already built this time as well? I have watched this several times frame by frame and from like 50-130 where he is pulling out the gags from his suit they really are coming from inside the jacket. Was there any additional prep for this part? Can you tell us a little bit about what goes into the design process for the models? version of the prop before the full version of the prop appears. Stop motion is all about slight-of-hand tricks like that. The props were made of clay, so it was pretty easy to just sculpt and paint the half-size versions. Rigid props like the iPad were made of Sculpy III and soft props like the teddy bear were made of Van Aken Plastalina. There were quite an assortment of object pulled from his jacket. How did you decide which items to reveal? Random brainstorming. I walked around the house and drew up a list of things that could be pulled out of a jacket. Having kids, this approach lead to a paddle ball, a duck, and a slice of pizza. There’s a really good book called Jump Start Your Brain that has a lot of good brainstorming ideas that can be applied to animation. I like to go to Netflix or Amazon and see if I can come up with one idea per DVD title, first going for quantity over quality of ideas just to get the creative juices flowing. Either the Ultimate Idea comes along as the brainstorm subsides, or I work with the list to zero in on a good one. This approach can work for any 11-Second Club entry preparation. How could this month’s audio work within the setting of each movie on the RedBox new release page? I have laughed many times at the expressions of the bird. The natural glance on frames 155-160 not only shifts the focus onto the brother, but contrasts beautifully with the craziness in the scene. While his look of disbelief at the end, helps emphasise the mood. Can you talk a bit about this character. The bird was my inspiration for the whole scene. He’s there just to observe the scene as it plays out, and I was amused by the idea of having an assertive character try to hold a goofy duck in a threatening way. I was also playing with the reason some actors don’t want to do a scene with a real animal. They are unpredictable, and they can upstage their human co-stars. So in this case the threatening pose is defused by having a silly duck getting all the attention. Where did you take your inspirations and influences for this shot? 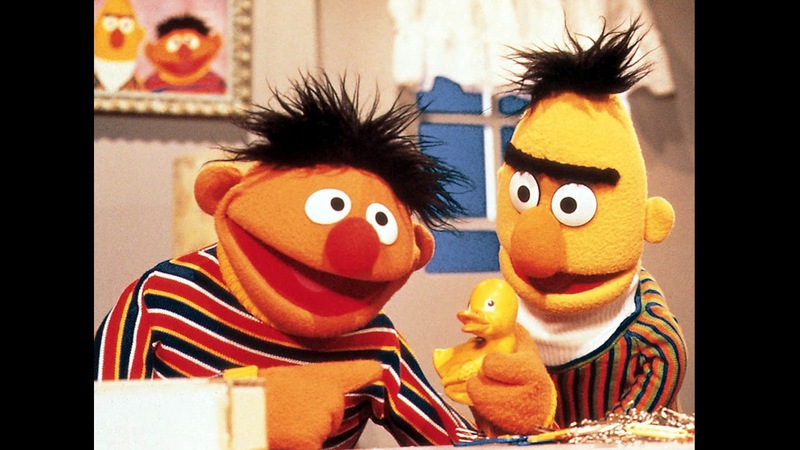 Ernie and Bert. You know, the tall, grumpy guy with the narrow head and the shorter placid guy with the round head. Nice and simple. Perhaps it even plays on the visual association burned into our collective brains from childhood. In general, I was also playing with overly dramatic art films paraded in front of me in film school. Nice to have some of that education put to use once in a while. Can you tell us a bit more about the build process? It starts with the armatures for each character, preferably ball-and-socket ones. Mine were left over from the stop motion films I worked on in the '90's. The violinist had a wire-based armature left over from a class demo. Wire can work just fine, but it has to be aluminum armature wire, and it has to be doubled up enough to hold itself up. It's a good alternative to ball-and-socket if you don't have $150 for an armature kit, though they will eventually break. Did this shot give you any trouble that you did not expect? The tall guy’s armature broke in two places. The spine came loose at a joint, which wasn’t too hard to fix, but then his foot broke, and I couldn’t even solder it back on. I ended up building a foot (fortunately not needing to be seen on camera) out of wire and epoxy putty. Most readers of our blog come from 3d can you tell us how your production differs for a stop motio shot from a 3d shot? Stop motion calls for a lot more planning and preparation. While the lighting, shading, and set decoration can happen any time in a CG production, a stop motion shot has to have pretty much everything in place before the shooting starts. And the more planning for the performance the better, because any little change desired after shooting calls for a reshoot. For this reason, shooting stop motion is far more intense than CG, requiring constant concentration and attention to every detail in every frame (I find I need much less coffee in a day). For example, I got so preoccupied with the effect of having all the props pop out of the guy’s jacket that I didn’t realize until I was done that he was drifting from side to side too much. If it had been done in CG, I could have gone back in and fixed that. But with limited time to shoot I couldn’t afford another day to reshoot. I had to live with it. Then my nine-year-old daughter (my toughest critic) pointed out that the mom needed eyelashes. In CG I could have modeled them in. But for my project, the set had been struck and it was too late. Weight consistency plays a key role in delivering a believable performance. Talk about the challenge of handling weight in stop motion. As with all action in stop motion, weight shifts and balance has to be planned seriously in advance. It’s simple enough to get the character in a well-balanced first pose since it can be worked and reworked before the animation begins. But then the character has to move into that next pose in a way that ends with a properly balanced stance. So if the character is going to shift all his weight to the right foot in that second pose, but all his weight accidentally moves over that right foot before he has struck pose B, the shot is now in trouble. There is no undo button, just retakes. I believe it can be extra challenging for a stop motion entry to compete. However, each time you have entered, the community of voters have fell in love with your puppets and unusual storylines. Please talk a bit about your motives for entering. When I’m between animation jobs (or between semesters when I’m teaching), I want to still be animating to stay active and refine my skills. So for my CG employment pursuits I have animated dialogue shots just for my reel. But it can be difficult to be motivated to do excellent work when I know that my first audience will be a few recruiters. The animation ends up being uninspired and is eventually cut from my reel. For my stop motion reel I wanted to find more inspiration for doing good work. The 11-Second Club adds an element of competition as well as a wider audience, making the project more exciting. I end all of the classes I teach with a tour of The 11-Second Club site with the recommendation to enter during the breaks to keep active. You have a background in 3d at a little up and coming studio called PIXAR as we talked about in the last interview. Can you tell us a bit about what you take from that into your classroom? I taught both stop motion and CG animation, and of course the CG animation is all about what I learned at Pixar. And since all the principles of animation apply to stop motion, the same aspects of performance and believability find there way into those classes as well. Stop motion puppets need to be as alive and engaging as a CG or hand-drawn character, so we explore creative acting choices and subtlety as well as balance, weight, and mass. My lectures on walks were almost exactly the same for CG as it is for stop motion until it gets to the demo itself. Thank you again for talking with me. Do you plan to keep doing this until you win? 3rd time is the charm. I only have time to enter when I'm unemployed, or between semesters when there isn’t much freelance work for me, as it was in January. I’m also starting a new project that combines different styles and techniques of animation that will also hopefully generate some tutorials. In this video is about dealing with floaty-ness in animation. Specifically floaty-ness caused by going from stepped to spline too early. To expand upon what I said in the video. The goal is to have a key roughly every 4-6 frames. If you have that before you go to spline then you should be in solid shape. You only really get in trouble when you have really long stretches where there are no keys to help sell the movement. In some cases if a move is complex you may end up having keys every 2 frame or if a move demands frame by frame changes then having a key on every frame in blocking is fine. Anyway guys thank you for watching my video and following the blog! The inclusion of props often provides a big challenge to incorporate smoothly into your animation. Here's a great tutorial by David Latour on how to use constraints, taking you through from the basics into interaction with both hands. 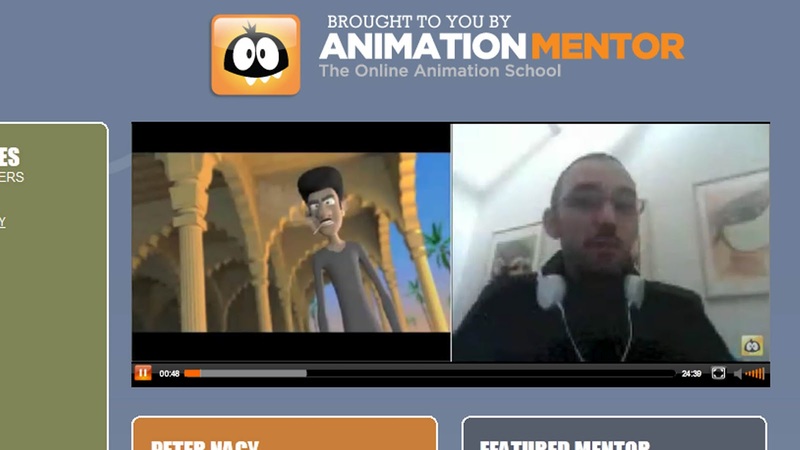 AnimSchool have just released a wonderful interview with animator Cameron Fielding. Discussing indepth both his industry experience and his workflow approach to different scenes, this is one interview I recommend checking out. The interview includes a showing of Cameron's old animation reel. Watching it explode to life with the Turok scenes, before being beautifully balanced by his acting is really a joy to behold. Please click the below pic to enjoy the read! For those Aardman and general stop motion artists out there, please check out these links to the Bristol Studio's new feature film, The Pirates! Band of Misfits. First up, are a series of videos hosted by Sony. Amongst their content, I was mega fascinated by the mechanic hidden within the pirate captain's beard. Watching overlap can often be taken for granted. That is until the problem is highlighted and you see the mechanical solution. To watch, please click on the pic. Meanwhile, over on Skywigly, the site hosts an interview with director Peter Lord. Enjoy! A while ago, I made a quite unspectacular Bouncing Ball rig and an obstacle course, and I thought I'd share it with you here. The Bouncing Ball even has a tail, although it's quite ugly. Look at this picture. The tail is hidden by default and can be made visible by turning it "on" at the main ctrl. It has four strictly FK controls. The ball has squash and stretch, and to rotate the squashing/stretching, you need to rotate either the main (not so good) or the offset handle (better idea) Since this is happening via a nonlinear squash deformer, this feature is rather ugly as well. I might get around to making this more beautiful sometime. The Obstacle Course has the bouncing ball rig referenced. This one is far easier to explain, it has the above mentioned Bouncing ball rig referenced, you can either point Maya to the rig, or click cancel upon prompt and reference your own rig. This is made to be looked at from the orthogonal front view. The stuff that can be animated has some control objects, and the tubes feature one locator each, located at the exact middle of them, so you can constrain the ball to these locators and rotate them to have the balls move along the tubes. MC 28 - Its Hammertime! Four people treated us with their great contributions this time. First off is Adrian Sanders with his version of a heavy lift and hit, who showed some impressing improvements during the making of his contribution. Next up is Arnold Balaka with his nice take on how a ringing phone can be very painful. Alex Watson contributed the third piece on which he showed his great ability for animating heavy objects. Last but not least is a very well executed high striker in a beautiful setting, made by Martin Bélisle, so make sure not to miss that one! This is the first time I'm creating a Mini Challenge, so I hope you all are going to participate nicely and enjoy yourselves. Everybody has done walkcycles by the hundreds, I'm sure, but what most people are neglecting a bit is the (not-that-easy) task of having a character start walking, and while this might usually lead into a vanilla walk, to do something different, why not have the character enjoy his walk the same way you enjoy animating it? In this task, you might learn a bit about anticipation, weight, and conveying emotions through body language rather than through facial expressions. There are multitudes of different walks, even if they're timed similar, they might look completely different. To get you a bit exited I'd like to post this awesome animated Animators Survival Kit logo made by the great Richard Williams himself! Since we started late, and this be a fairly complicated task, I'd like to set the deadline to the 23rd of april. Try and stay within a 75-125 frame range. If you're having troubles, have a look at the how to use dropbox and the how to participate links to the right of this post, and please try to keep the video below a size of 10 MB. We can quickly start to feel like we will never reach our goals. This is challenging and it can really hinder your ability to be creative. In this post from Animator Island they offer a simple solution to kick start your thinking. Criticism is a very important part of learning animation. We work hours and hours on a shot hit playblast and send it out to the world. Sending it out at first can be very very hard to do and as a beginner you want it to be great! The reality is, we are always learning. Sometimes you can't see what is missing from your shot and what you get told isn't quite what you wanted. This post tells a story just like that. It is important that when we solicit advice we are doing so hopefully from people who want to see us succede. Don't take things personally and remember the criticism is about your shot and not you. 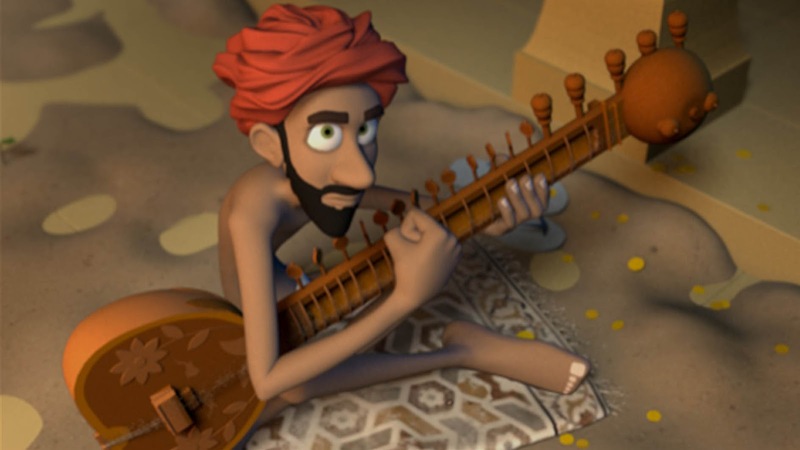 In January 2012, the 11 Second Club set the challenge of animating to a Hindi audio. We saw many great entrants rise to the challenge, with Peter Nagy taking the crown of first place. In doing so, he becomes the first person to win with both traditional and 3D entries! Now this interview is a little different. I was made aware AnimSchool wished to steal a march on our interview and talk to Peter about his workflow and using the Malcon rig. It is a wonderful interview, which you may find here. It did however put the pressure on to go a little deeper. You created and run the traditional animation resource, the Living Lines Library. The artwork shown looks considered rather than randomly posted. Please talk a bit about your reason for building the site and your personal values for the choice in work the site presents. In its beginnings, I had a couple of thoughts in mind. Why isn’t there any website that can bring together material from animation films? 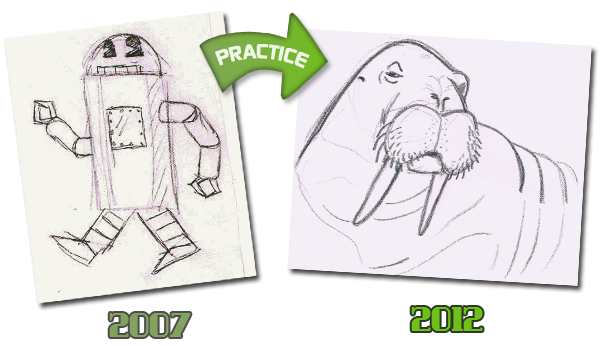 And why there cannot be a site where the pencil tests are systematized, posted alongside other production artwork? It all started back in 2010, after producing Animated Heaven. I had an allergy and the illness was quite serious, meaning I had to go to hospital for a couple of weeks. When I could leave, during the recovery I quickly reserved the livlily.blogspot address for myself. I thought I’d rather start the website now, because maybe later I might not have an opportunity. This was when the uploading started until the publication, from October till December, from my secret collection. I had been collecting animation material for a while from the internet and from the films I worked in during my career. I didn’t want to keep them in a drawer or on a private site. Now when I search for artwork material on the net, sometimes I only find 1 or 2 pictures of a film but if the searching is more effective, and a more substantial material collected on my winchester in one of the folders of a film, I compile an article on it. Or if the material is more complete, I put it on the main page. I love searching for and it’s a pleasure to me when I find concept material in the huge net-ocean. If something is strikes my curiousity, I take a closer look, sniff around wink my eyes a few times and if they pass this instinctive authenticity test I collect them immediately together with their source. It was in this manner that I started to build, so there wasn’t so much awareness in the appearance of the artwork material (although in the first year, I only knew one thing for sure that the main article at the end of the year will be The Secret of Kells). At first I thought there will only be black and white line drawings on the site, what is more, I believed that the pencil tests will be the main profile of Livlily. However, the page began to shape itself and after a while it became clearer. In the meantime, I realized that storyboards are drawn for every film, this is how the first works from 3D productions appeared. In the beginning, there weren’t enough colour on the site. Later on, some painted backgrounds and colour background concepts appeared beside the background layouts, and finally, all kinds of pictures which were hand drawn or digitally painted. With this, the category of artwork materials strengthened and besides the ancient, traditional technique we could get an insight to the workflow of other animation genres on the site. Besides the big features, I also upload pictures from lesser known or less successful films. To me, the most beautiful are the concept and production materials that they are completely ‘clean’. I mean that these characters, locations and separate little universes just dropped out of the egg shell and I only see the creators’ drive and talent on them. Here all of them are equal with their originality, clarity, independent from the fact whether their story will work in the finished film or not. If you had to choose three personal favourites from Living Lines Library, which would you pick and why? If I had to choose, I wish the first to be a cel image. A couple of years ago I was browsing on the site of the late Pres Romanillos when to my great surprise, I came across a beautiful cel picture from the Hungarian feature film, Son of the White Mare (1981). It was only then I realized how greatly Marcell Jankovics’s film acknowledged across the boundaries. As far as I know, this is the only picture available from this film, and today it can be found on Livlily only. Next, I wish to pick my favourite picture, but this would be very difficult. I would probably pick one from the forefather of the lines Milt Kahl, I’d rather avoid such choice now :) So instead, let the next one be a background from the Lady and the Tramp (1955). This image is a bit contradictive. Despite that it is not too bright and clean I still see it as beautiful. 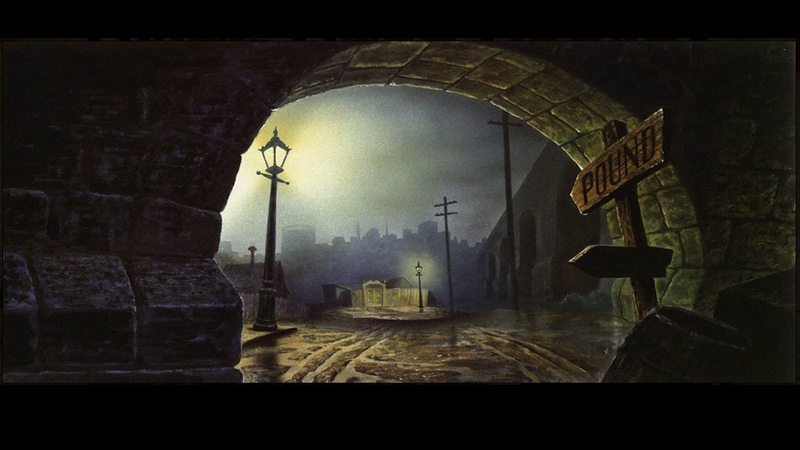 It could mean a dirty street for you, or you notice the little gate in the middle which might lead you into the light. Probably everybody sees it according their own temperament. If I wanted to tell my own story, I would choose similar environment and atmosphere. I wish my final choice to be a pencil test. My favourite at the moment is a really short film in reality, that is Mickey's Fire Brigade. Time has matured it, dates back to 1935, so it turned 77 now. This is one of the oldest pencil tests available for many of us. It is amazing how the film still has an effect on me. I haven’t seen the colour version of it, but watching only the line-version, I laughed all through, its creativity and the wonderful, daring movements. It has an amazing, beautiful animation from the early times. Time management is an important value for successful animation production. Especially with the danger of burning out your creativity. Please talk a bit about balancing Living Lines Library, your competition entries and also production through your employment. Advertising, in which I presently work, can be a little bit unpredictable and January was a bit too busy at my workplace. There was a deadline of an important project at the end of the month which all made my taking part in the competition a bit uncertain. I knew if I wished to enter, I could only deal with it after work and at weekends. It soon became very important for me that January consists of 31 days. I needed all the time available, which is always short before the submission. In these cases I use a simple magic trick to lengthen the days and hours: I sleep less! It is already hard for me to stop working once I have started. I wouldn’t have got much sleep anyway, because it is always on my mind. Whether the drive lasts for a month or even longer depends on the idea. There wasn’t any problem with my performance at my workplace, the project promised until the end of the month shifted to February and I took a day off on the 31st. Living in Hungary means there is a difference in timezones, of which I am thankful for. On the last day, I was constantly looking at my watch nervously. The time goes by and the dreaded midnight comes... but, I can still work 6 more hours because of the time shift. These extra hours are very important at the end. They were used to bend the straight smoke stripe of the flying cigarette to make the arc nicer. Mother Earth is your seventh entry in the 11 Second Club, your second as winner. Throughout each entry, I have grown to admire your consistent wish to challenge and experiment with different styles and ideas. Please talk a bit about your motives for entering. I arrived at the territory during the shining of the flawless scaled, ultra-talented BJ Crawford, which wasn’t a safe period for a beginner. After the first two 3D works I had to realize that if I want to be timely it would be worth returning to the traditional technique. Thank God this change proved to be successful, with the promotional animation of the Power TV. It was exactly a year before my winning work that I started animating on 11 seconds’ clips, back in 2008 October. For the audio Somebody's Gonna Win, I would have liked to have done a 2D and a 3D character looking at each other, face to face - this mixing of techniques matched the voice, and I hoped the audience would have appreciated it. However, at that time I was a beginner in 3D and I could only do a lipsync test). I finally produced this idea after the competition following Power TV (although in the meantime a mixed animation had already been made by Bruno Carias Fogaça). This entry was a nice transition to my next work by which I returned to the beginnings, the 3D, somewhat more experienced. From here onward, a story were beginning to take shape. From that time this was my main motivation. It is a little bit ironic, that now when the traditional technique has returned to the 11 Second Club with the winning works, it is me (editor of Livlily) who breaks this glory with a 3D work. "After my latest outcome I had a little moan here at the forum, that I will never compete again :), but I have to admit, it was a bit too rash statement. " It is a prime example that exploring unfamiliar territory can come at the risk of disappointment. At one time or another, from the beginner to the largest studios, we all have felt this disappointment. Many of us are just glad to see you back. Please talk a bit about your reaction to June's competition and your reasons for returning. I know this is not going to be a tangible explanation, but after coming first in 2009, I had a feeling that I will win again here some day. I was chasing this dream and I really wanted to win. I always compete because I want to win. Not just taking part, trying myself out in the field, but win. This is the truth. It was like this, even at the first time when I started competing. However, the final results of 2011 June’s competition was my fifth disappointment! I left the “only-locally” movements behind and forced myself to make full-body animation which I have to practice anyway. I worked with two characters in one scene and moved both of them. I didn’t want to cheat the scene with editing so that I don’t have to show them at the same time. I think my idea was great. A lion, who is the king of animals, but he thinks more of himself and he thinks he’s even superior to his tamer (the man). He is just a spectacle in a circus, because he has a special talent: he can speak ("I have a voice!"). He is King, the talking Lion! So I did my best again and couldn’t even get into the first 11! You also stated your intention to once again push your own boundaries. Please talk a bit about any goals you had when starting January's competition. I became very excited when I heard that Han Liane-Cho is again in competition in December. He won the 11 Second Club competition a month before me back in 2009, also with 2D work. He hasn’t competed since, but I really thought he was going to win. 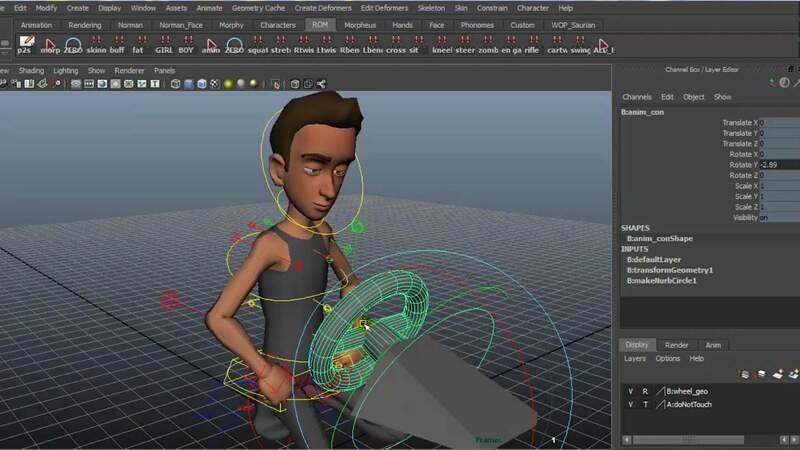 Only a few people have had the opportunity to try to win with both traditional and 3D animation. One of the most successful warriors to the cause was the Brazilian Bruno Celegão Monteiro. Bruno who won two times with 2D work and once he came third with 3D. The December result hasn’t came out when I started brainstorming on the January’s dialogue. My main drive was still: will there be anybody, an animator, who manage to win in 2D and in 3D as well? That would be a good story! The audio was taken from the Bollywood film Deewar. 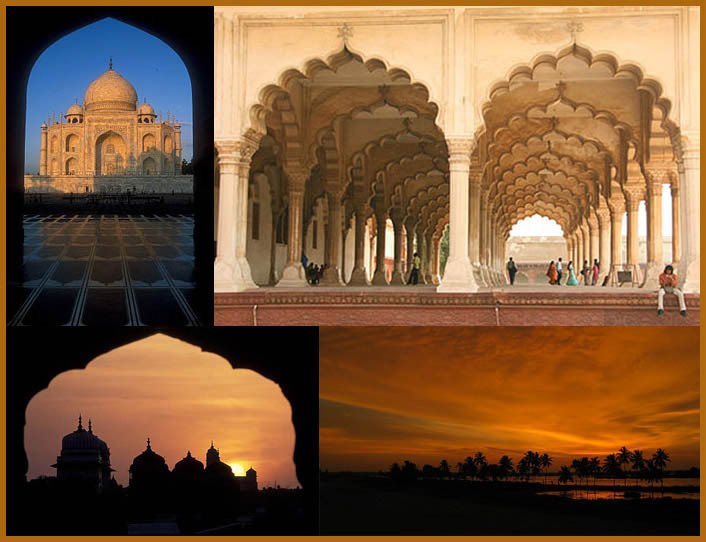 Is Hindi-Urdu a foreign language to you? If so, did this influence your choice to animate the lip sync early in production? My working method changed a bit at Chatty Cathy Pinocchio, I always start the animation with the lipsync since then. As a Hungarian animator, it is not always easy to find the right lip positions, let the dialogue be in English or in any other language. If I did the character’s animation first, I wouldn’t have any energy to work out the important details at the end of the month. So I do this part first. Therefore, I pass some evenings with the lipsync, and only then I start the animation of the body and I keep refining the lip positions so I deal most with it during the whole work. The excitement is great at the beginning of the month and I don’t have the whole scene or character in my head. Still, I can start the work with the lipsync which I must begin because of the diminishing time. Once I manage to overcome this difficulty of finding the whole story, I will calm down. I do a little shadowboxing in the middle of the room and thus the work can be continued: the actual animation can begin! During a conversation with Indian animator Dapoon Rai Dewan, he commented that your acting choices fitted admirably to Indian film culture. Please talk a bit about your planning stage for these characters and environment. My approach to the voice was that it wasn’t a jabber (although I didn’t understand a word of it), but a text in Hindi language. I wanted to taking it literally. This might reflect that I’m stuck-in-the-mud but I didn’t want to ignore its origin and didn’t want to make an animation that “just came to my mind” for the voice. This approach already implied the appearance. At the beginning, the environment only appeared vaguely, but I knew I wanted to see typical Indian characters with tanned skin, black hair and a big moustache. I was already walking through Indian locations in my mind when I started searching on the net. 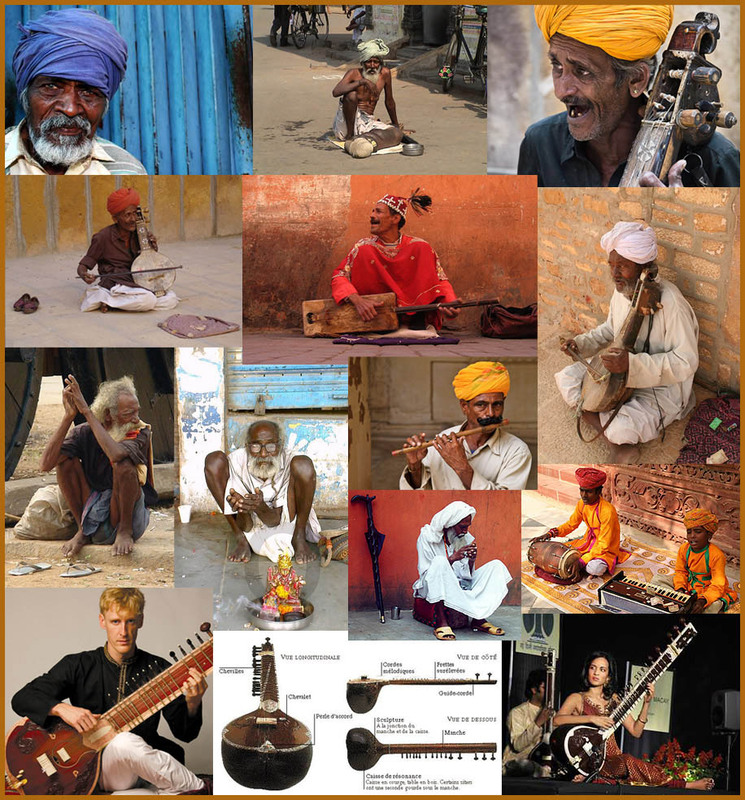 I was looking for pictures of Indian people, streets, street musicians, beggars, turbans and sitars. 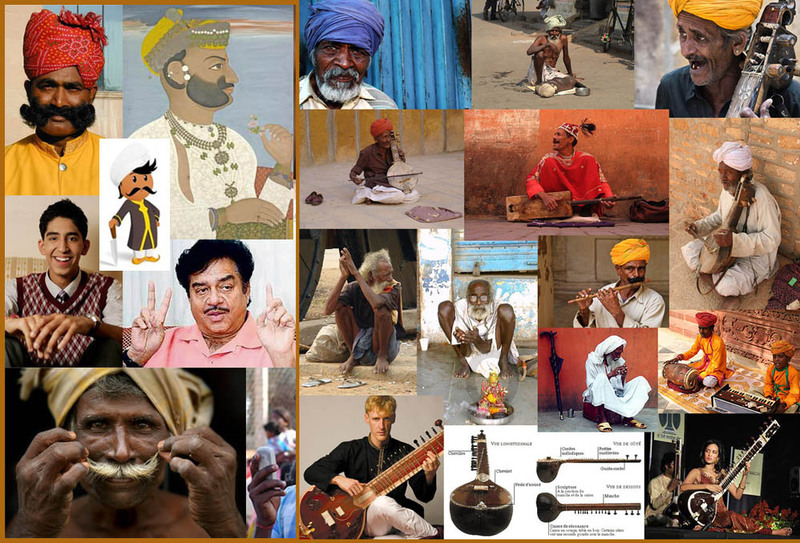 I watched shots of how people played the guitar, the sitar, how they hold the instrument or how they sit while playing. As for the environment, I searched for an architectural motive. The one I found in silhouettes at first in the characteristic roof shapes. I wanted to solve the environment as simply as possible, yet I needed more than a silhouette, that’s how I got to my final reference. I wanted a set that can be identified in the first second, reacting to the text which has always been an important factor to me. I thought that every situation which is not in connection with the origin of the language just wasn’t right for me. You can see beggars and street musicians in the character reference images, yet I didn’t want to present my character in the second scene as any of them. (Although the ground is scattered by coins around him, he didn’t put out a bowl to collect them.) This is additional information, that depended on the render. I didn’t have time to work it out of course, but the story did work nicely even without it: in reality, (and somewhat inconceivably,) I wanted to represent him as a ‘holy man’ who got out of all earthly bounds. Discussed in your previous interview with Eric Scheur, you mentioned the influence of Eric Goldberg for building beautiful arcs and shapes in your gestures. Kenny Roy highlighted this in your eCritique, particularly on frames 137-147. Can you talk a bit about adding these kinds of exaggerations into your 3D work? These kind of sudden movements require these distortions and Malcolm made it possible for me. Although at the beginning, this change seemed a bit risky (Malcolm’s appearance didn’t seem transformable at first sight and I hadn’t worked with him before), it proved to be the best possible choice in the end. I could stretch him however I wanted and set him into any poses I pleased. This liberty was superb! I could put arcs in my character’s silhouette with such an ease which was only possible in drawing before. 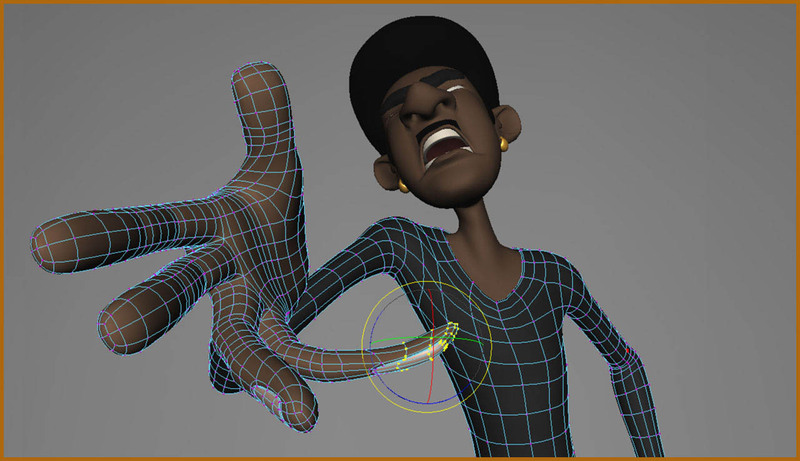 At the closing gesture of my negative character – the part Kenny mentioned – I passed beyond the potentials of the rig and moved the vertex points of the fingers as well, so that the arcs would help the quick turning over of the hand. I watched the frames of Aladdin for the Power TV, and this time I also had an animation reference. At the beginning of the month, when the idea only started to take shape I searched for energetic and furious characters among the figures of the animated film history. 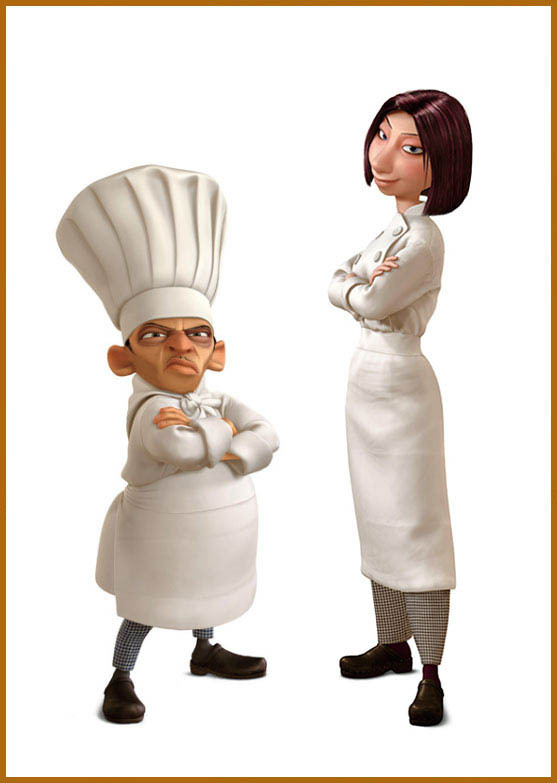 I soon found them: there were two of them, in one film, in the same kitchen: Skinner and Colette, from Ratatouille. I cut out their scenes from the film and run them through a few times. Since the time was very short, I didn’t get so close to these brilliant references as in the case of Mr. Goldberg’s work at Power TV, but Mother Earth had a little station a before shooting my own movements. I was very pleased to hear the praising words and changed the scenes before the HD render (although I was pleased to not have to make many wholesale changes). I must add that unfortunately, English isn't my first language so I had some problems understanding. But I'm on it. I'm not going to give it up, I’m going to listen to it a few more times and I’ll get some help as well. As mentioned above, you have now entered seven times. Please talk a bit about your portfolio of entries, reviewing both your strengths and weaknesses. Alright. I’ll try to be to the point. Exciting start. Charlie’s story was yet fetched from my private life. Everything was based on the name, Charlie. The character. To my approach, this schizoid artist thinks he’s Charlie Chaplin. Conjuring up the table ballet is sweet at the end, but entirely, it is not intelligible. There could be a lot of correction on the animation, but it is OK, for the first time. I like the atmosphere of the dressing room. The dressing room, where the posters are not reflected (which also means I moved two characters in the end at the same time). Fresh and full of ideas! A new kind of phrasing on the site. The audience appreciated the literal approach of the text (all what is heard becomes alive). The animation is not indiscreet, moderate and nice (it disturbs me at the end that the head and the hand holding the Globe stop at the same time), however, the abundance of the ideas grows over this problem. This is its main merit: the ideas. Ever since, I have also had the highest ranking in the unique category - which is great! The situation is not clear again. At the voting, even the title did not give any clue to identify the location. I like the colours. The animation is ambiguous. The 2D old woman (who is supposed to be Bishop’s drawn version) not explicitly strong, a little bit repetitive, but it becomes a bit better at the second half. 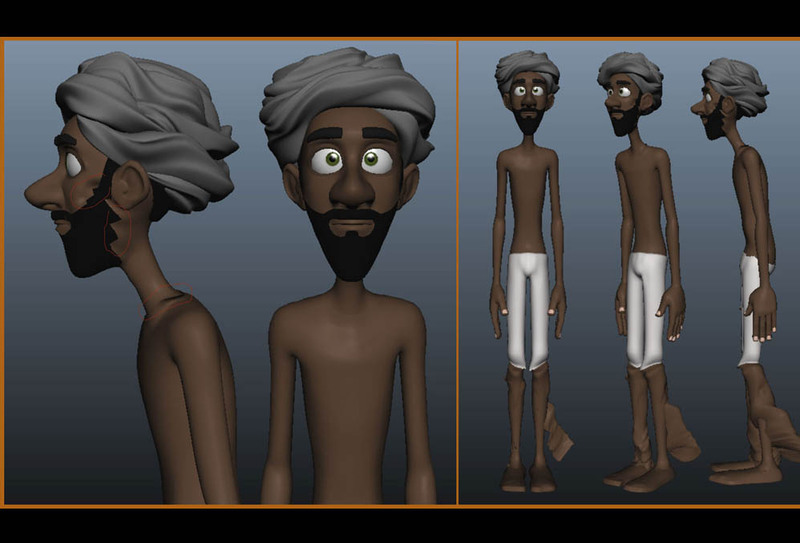 My 3D character is not worthy its 2D predecessor (the promoter of Power TV), he doesn’t move enough. The small gestures are missing from the hand when we see him beside the old woman. This is my most exhausting work. It came in fifth place thanks to the ideas and the mixing of the techniques. Unfortunately, the contrast between the characters does not work. It is also over moved. There are a lot of movements and we do not know who to focus on. Looking at the characters separately, I like the animation otherwise (except the last scene, where we couldn’t find the right colours). At the beginning, I don’t feel the nervousness of the lion. There are nice details (the traner’s game with the crown or keeping the balance of the composition with the lion’s movements), however, despite we see a full-length animation and the idea is great, it did not bring the expected result. :D The mane should move more! And finally, my most recent entry. At last, the contrast works well. What I like in this work, is that it plays around the genres a little bit. It has a funnier, overplayed start which cools down and turns into drama at the end. And this change surprises us at the very end, at the grabbing of the soil. I like its seriousness it gives a kind of depth to the work, which is not necessarily youthful (if I consider the audience of the site), but mature. The body of my first character should move more beside its wide gestures, with various poses. Among others, I liked animating the gesticulation with the hands (frames 100-118), which was a spontaneous movement during shot of the reference scene. An interesting motive is the Earth which connects it with the Power TV. During an interview for YouAnimator, discussing pre-production of your Chatty Cathy, you spoke of other artists who contributed towards your entry. Please discuss the value of having a network/team. In my works, the role of the assisting colleagues are really important, without them, I’m only a one-winged albatross, that is why I mentioned this in that interview. The hand-drawn Power TV Promo wouldn’t have been assembled if it wasn’t for Csaba Pépp’s help in the post work. For production of Mother Earth, circumstances were not the most favourable. My friends, whom I have been working together for a long time, were so overloaded with work in January that none of them could tell for sure whether they could help me if I entered. 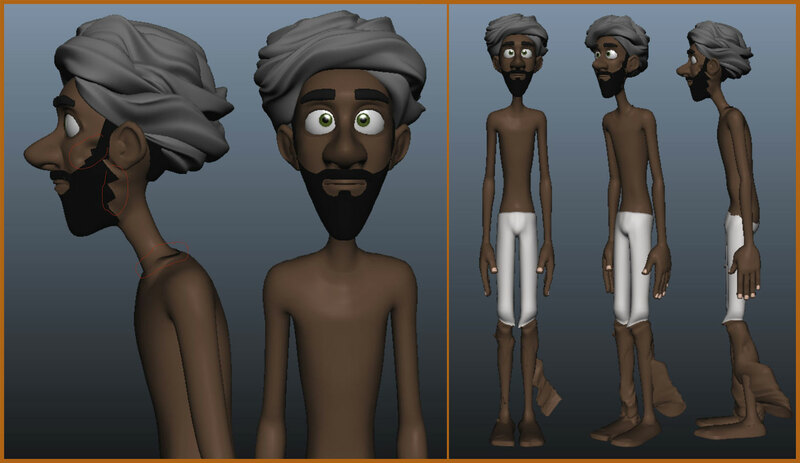 I modeled the church and the palm trees already at the beginning, but in making the more important accessories of the characters (turban, rug) I asked for an ex-colleague of mine, Patrice Creusot’s help. Thanks to Szabolcs Siklósi for the lighting and render settings, and to László Maczó for the post work (he helped me in the modification of Livlily’s blog sablon). When the idea of the cigarette came (to fill in the silence after the first short sentence and to make the character more negative) I had to look for an effect simulator as well. I tried to avoid these extra and unnecessary supplements before, but this time I needed it. I wanted to make my story complete. The cigarette smoke was created by Attila Chovanecz. I downloaded the sitar from a 3D model library. I changed its colours, I stretched strings on it, and then I had a very important character. Many entrants ask if they can produce a clip as part of a team. Please talk a bit about some of the challenges of working as part of a team. I believe if many people are working on a project, it is always worth thinking through the working process. If we start testing the lighting only after the completion of the animation, it might not be ready on time. Some time is always needed for render and post work, so the final animation must be finished a few days before the deadline. In the case of the smoke, I had to clean up the movements of the first 40 frames as soon as possible (the character was in close contact with the cigarette at this part). This wasn’t easy, because I only see for sure whether the beginning works or not when I see the complete and final animation, so I keep refining the details until the end. We were planning to make a little sand FX at the end, when the street musician grasps a little soil. This was omitted since it would have been too problematic to simulate it and solved it with the falling of some pieces of ground. My friend Szabolcs completed the lighting in the middle of the month. The first tests were made with a roughly moving character, but with the final environment. Later, we updated this scene - containing the light sources - with the continuously improved animation. I had such an idea at the very end, (to avoid the attacks coming from the final render) that I would upload the whole scene in black-and-white or brown-and-white. I kept it a secret even before the lighting expert, he gets to know it just now, but I was simply unable to give up its colours and atmosphere in the end. The excitement of the competition is great, that you have to clean up the concept quickly and precisely, you have to consider the possibilities and the workflow practically (and you have to carry it out consistently). I’m glad for the help from others. This help is invaluable and I can only give the credits in return. I’m pleased that they believe in the final result, too. I love the organizing during work, which is just as exciting to me as making the animation itself. Together with that: when finally on 5th after a movie, I open the site terrified/excitedly to have a look at the results of the voting. Congratulations again Pete and thank you for your time. I wish to leave you with Pete's development work for the clip. I you all enjoy!